Link to the transcript of the diary (Vol 4) of Matron Mary Ann 'Bessie' Pocock, Australian Army Nursing Service. She was at Cobham Hall from 26 October 1917 to 1 January 1918. Photos from the collection of the Australian War Memorial. Australian convalescent soldiers and ladies on the lake in the grounds of Cobham Hall. The picture gallery containing 33 beds. Australian convalescent officers playing croquet before the west front of Cobham Hall. Dining room of the hospital with tables set for Christmas dinner, 1917. 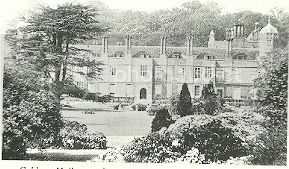 My father, his parents and his sister all worked at Cobham Hall, as they lived in the village. As a small child I used to wander the Hall and its grounds as if I lived there! Such marvellous memories. When I get the chance to return there, I and my family are always made to feel welcome there, even though its now in different hands. The Prime Minister of Australia and Mrs. Hughes spent Christmas with Lord and Lady Darnley at Cobham Hall, near Gravesend, which has been a convalescent hospital since the early days of the war. Over 1,300 officers and 100 men have been nursed back to health during this time. The hospital, of which Lady Darnley was the commandant, yesterday ceased its beneficent work, and is now closed. to the unsparing devotion of their host and hostess. Lady Darnley never ceased in her energies to see that her patients wanted for nothing, and many a home in Australia today will be deeply regretting the passing away of one whom they know never forgot them, while many friends she leaves behind, who knew and loved her, will never cease to mourn her loss.